THE XENA SCROLLS: An Opinionated Episode Guide (621 & 622) | THAT'S ENTERTAINMENT! Welcome to another Xena Thursday! Today, we’re concluding our chronological coverage of every single episode of Xena: Warrior Princess — both the episodes that I had previously highlighted AND the episodes I’d yet to feature. Complementing my thoughts were the thoughts of those who worked on the series: mostly actors, writers, directors, and producers. I have done months of research for the acquisition of the quotes you saw over these past 67 weeks (as there are 134 episodes and I covered two episodes per week). 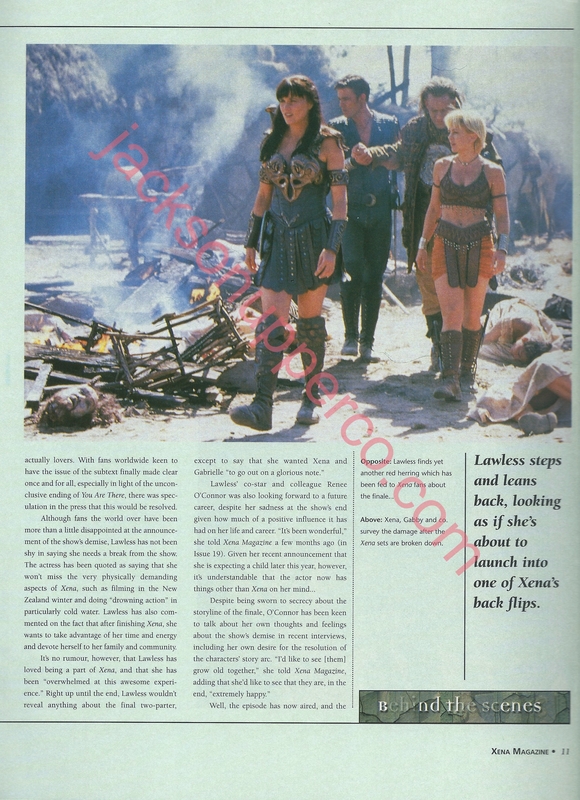 They came from a variety of sources, including the original special feature-laden DVD releases, The Chakram Official Newsletters, both the Topps and Titans Official Xena Magazines, the fan kits, and other assorted print and video interviews. So in addition to sharing my thoughts, these posts contained information and musings from the Xenites that matter most — the ones who brought this exciting series to the small screen. I featured this episode as #45 on my list of the 60 best episodes. Read my thoughts here. 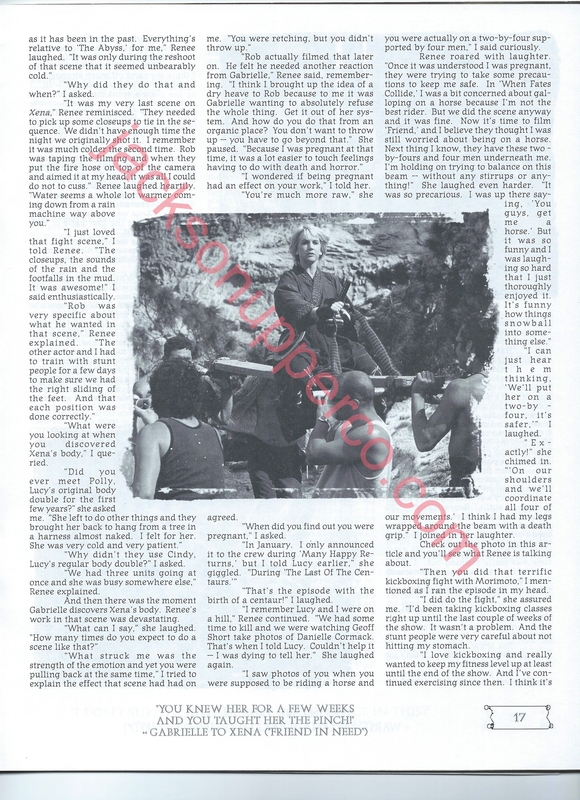 Here is an on-set report of the production of “A Friend In Need (I)” from Titan: The Official XENA Magazine, Issue #21. Part I made my list and Part II didn’t because the first installment has a tighter script. The problem with this installment from a storytelling point-of-view is that there are so many logistical elements of the culture that are only half-explained. (And even in the Director’s Cut, which aired less than three months after the finale and has been released on DVD several times, some things are never clear.) The biggest rule, of course, is that Xena needs to stay dead to redeem the souls of the people she killed 35 years before. In the Director’s Cut, Xena learns this information as Gabrielle’s heading to the mountain; in the official aired version, we never see Xena find this out, leaving the audience to wonder whether or not she knew all along. Either way, it’s the sort of bogus rule that insults fans because it seems like a slapdash ploy to keep Xena dead and imbue the series with some finality. While many fans hate the ending because it cruelly separates Xena and Gabrielle, my personal problem with Xena’s death is that these Japanese rules fly directly in the face of what the series and Xena had been telling us about the nobility of doing good to counteract the evil in her past, and what a waste death and/or imprisonment would have been. Sure, 40k people dead is a high count, but what about the thousands more she could have saved had she continued on fighting? It’s noble of Xena and perhaps makes sense that she would want to stay dead, but it doesn’t fit for the series, and that, in my mind, is flawed storytelling. As for what’s good about this episode, I maintain that, like Part I, there are some nice visuals, and Gabrielle’s growth as a warrior is satisfying. But for fans of the series, although Xena the character may be satisfied with her ending, the series itself concludes on a weaker note. 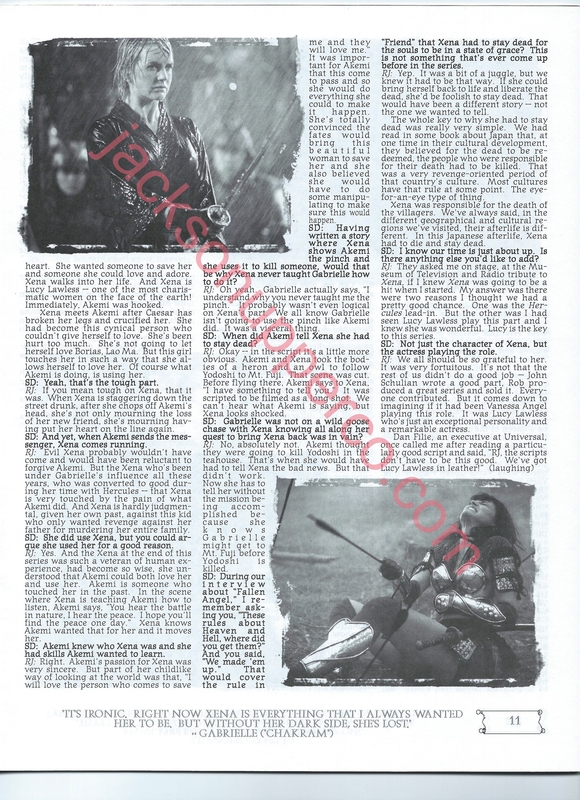 Here are scans of an interview that writer/producer R.J. Stewart gave on both parts of “A Friend In Need” for The Chakram Newsletter: #16. 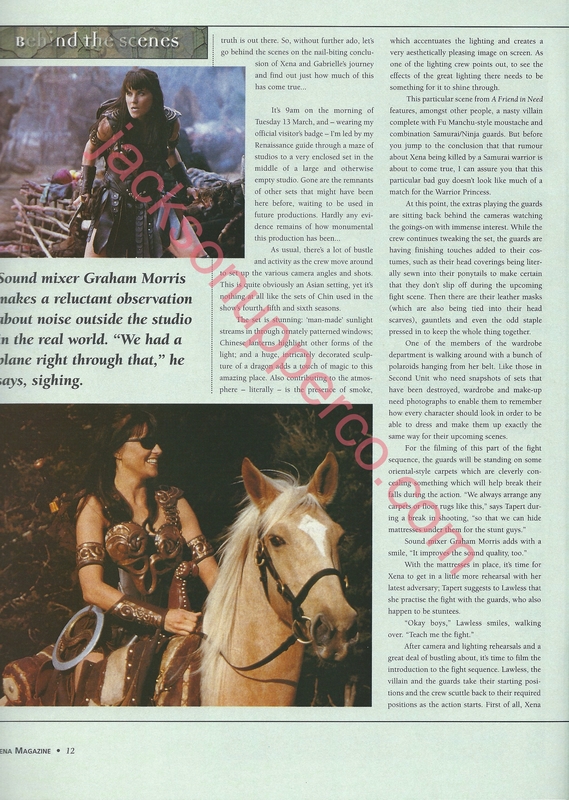 Here are scans of an interview that executive producer/writer/director Rob Tapert (with Lucy Lawless) gave on both parts of “A Friend In Need” for The Chakram Newsletter: #17. Here are scans of an interview that actor Renee O’Connor gave on both parts of “A Friend In Need” for The Chakram Newsletter: #17. 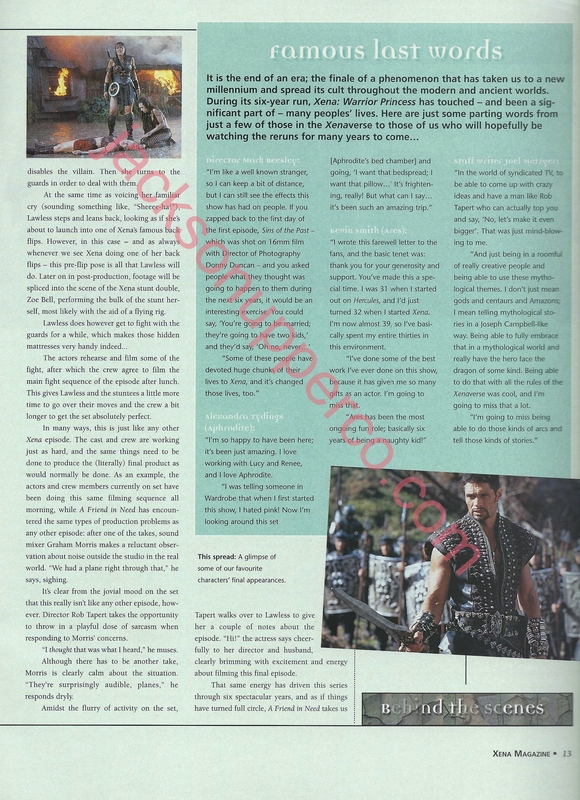 *Click here to see a behind-the-scenes account on the making of both parts of “A Friend In Need” that was produced by the Official XENA Fan Club and released on the Series Finale Director’s Cut DVD. *Click here to see interviews and B-roll footage from both parts of “A Friend In Need” from a segment that was produced by the Official XENA Fan Club and released on the Season Six DVD set. Come back next Thursday for the start of a whole new series of Xena posts! And tune in tomorrow for another Pre-Code Film Friday!